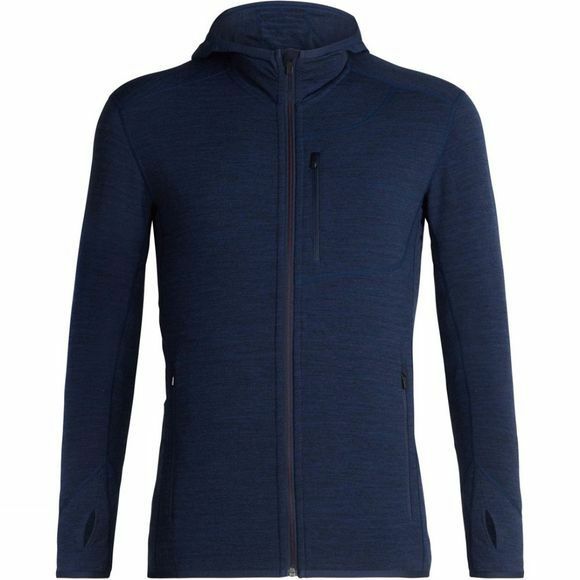 A technical mid layer designed to insulate and breathe during cold, high-output days up in the mountains, out on the slopes or on the trails, the Men’s Descender Long Sleeve Zip Hood is designed for those on the move. Made with our 240gm textured terry core spun fabric, which uses nylon fibres wrapped in merino wool for added durability and quicker drying, the Descender features a high-loft brushed back with heat-trapping channels to help regulate your temperature during technical high-exertion pursuits like skiing, climbing or running in cold conditions. Lighter-weight side panels help manage moisture and dump excess heat when you’re moving fast, while the zippered chest pocket with media cord port keeps your music flowing or stashes small essentials.